After the time I spent at King Arthur Flour’s Blog & Bake™ last week, I came home prepared to fling flour and bake my tush off. Oh, would that baking one’s tush off was an actual possibility. Sadly, I find that most of my baking actually adds to my overall girth since I’m unable to restrain myself around a fresh loaf of good bread. That loaf you see above is a perfect example of what renders me weak in willpower and wobbly in the knees. You’re looking at a Roasted Garlic Rustic Sourdough Boule. This particular bread is not one we prepared at Blog & Bake, but it makes use both of King Arthur Flour’s rustic sourdough bread recipe and the sourdough starter that I bought at their Baker’s Store. The starter they sell is pedigreed, people; it is descended from one that was born somewhere in the mid-1700s. This means -at least to me- that it’s doubly wonderful. We’re talking about baking with sourdough AND history. One of the things I’ve learned over the years here at Foodie with Family is that many people have anxiety that sometimes borders on phobia about baking with yeast. For those of you who are a-okay with yeast baking, please skip to the next paragraph. For those with breadphobia, allow me to offer you some words of encouragement. 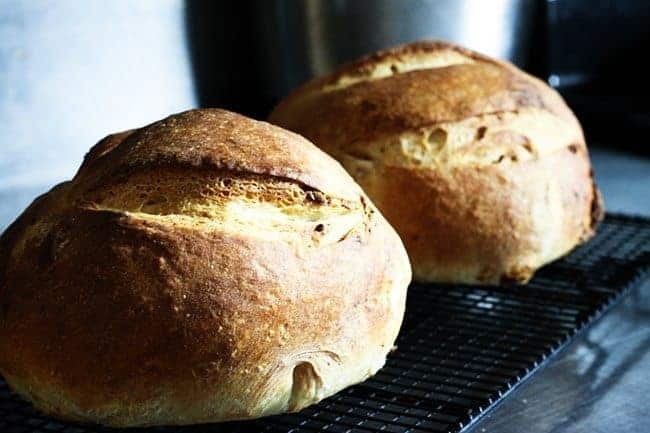 When you measure your ingredients the right way and follow instructions to the best of your ability, homemade bread seldom turns out inedible. It may not be pretty, it may not be exactly what you hoped, but there are very few occasions when it is too yucky to eat. In those cases, you find a neighborhood dog and make a lifelong friend or break it up and toss it out for the birds. All is not lost; review what you did, what could’ve gone wrong and try again. Someone or something ate well as a result of your efforts. I firmly believe that everyone can bake given the desire to do so and time. I’m here for you and willing to answer any baking questions and so are the experts at King Arthur Flour. In fact, they have a FREE Baker’s Hotline. 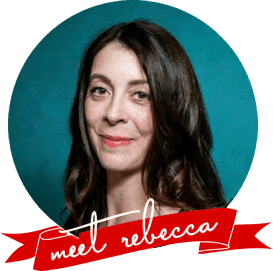 You can call them at 802-649-3717 or chat live online with their baking experts who can answer simple or complicated baking questions with equal aplomb. I assure you they won’t laugh at any questions, so don’t be shy. We’ll get you baking yeast breads in no time at all! I prepared the rustic sourdough as directed by sheet of instructions included in the purchase of the sourdough starter and decided to change it up a smidge. This was mainly due to the fact that I had already prepared four loaves of rustic sourdough bread according to their recipe (What? Obsessed? Me?!?) and wanted something a little different to dunk in that evening’s soup. The jar of roasted garlic in the refrigerator called to me and we were off and running. There are a couple of notes you may find helpful when preparing this gorgiferous, crusty, chewy, roasted garlic -studded sourdough bread. 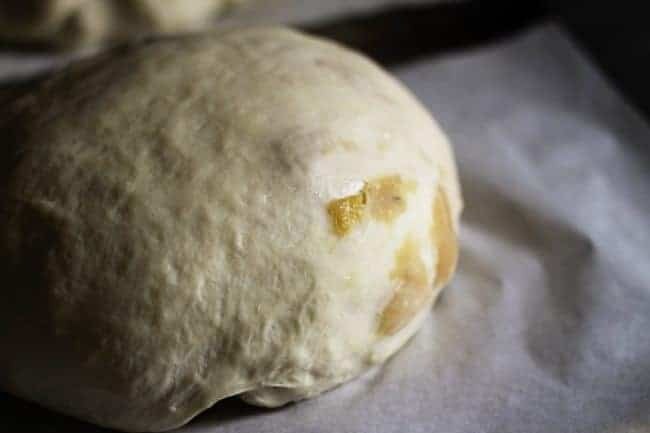 Instead of adding the roasted garlic cloves to the dough, we pat the dough out after the first rise and roll the cloves in before forming the boule. This allows us to have more visible garlic in the finished product instead of smashing it into oblivion while kneading the dough. After we roll the dough up into a long tube, we still have to form the ‘boule’ or dough ball. We do this by pulling the long end toward the center of the loaf, rotating the dough about 45°, gently pulling and folding that toward the center, rotating 45° and repeating the process until we get a wad of dough that is roughly round in shape. Now that you have the dough all bunched up, we flip it upside down so the smooth side is up and cup the dough ball -hands like blades at a 45 degree angle to the countertop- and rotate the dough ball, first pushing with one hand and then pulling back toward you with the other. If you’re doing it correctly, you’ll feel the dough ball firm up and see the ‘skin’ of the dough tighten. Don’t overdo this because you don’t want all the roasted garlic bursting through that taut surface of dough. If a few pop through here and there it’s alright, though! I score the tops of the loaves before baking them to allow them to expand without tearing as they bake. It doesn’t hurt that it makes it painfully pretty to look at when it’s done. If you leave them like this, you get hearty, classic, chewy, mild-sourdough loaves with cloves of roasted garlic throughout and a shatteringly crisp crust. 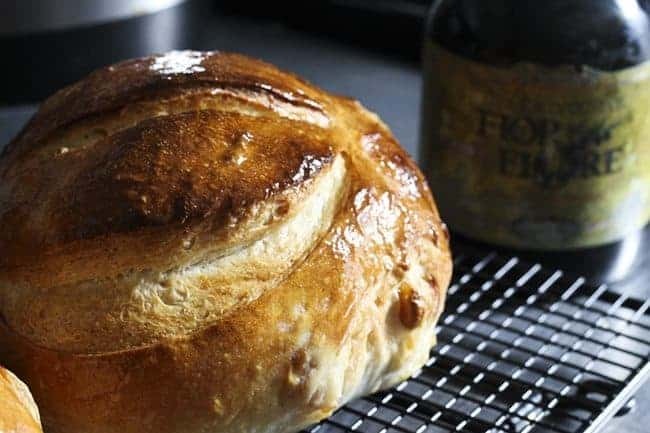 I’m fond of gilding the lily, however, by brushing the finished loaves generously with extra virgin olive oil and sprinkling with super-fine sea salt. It renders the super-crunchy crust a little softer and chewier. If you’re not a fan of a softer crust, skip this step, but I actually prefer the softer crust for sandwich making purposes. Besides, I take any reason to get garlicky olive oil and salt on my fingers so I can lick them afterward. This bread is sturdy enough to hold up to sandwich fillings, toasting and topping with a fried egg, or serving alongside soups and stews to help sop up that last little bit of whatever deliciousness is in your bowl. Oh, and hey. If you had leftovers that were getting a touch on the stale side, you could turn them into the world’s most enviable croutons. I have to know! How would you serve this bread? 2 teaspoons instant or active dry yeast no need to dissolve either in water first. Whisk together the flour, yeast, salt, and sugar in a large mixing bowl (or the bowl of a stand mixer fitted with a dough hook.) Add to that the sourdough starter and water and mix with a bowl scraper, sturdy spoon or dough hook until a shaggy dough forms. Turn the dough out onto a lightly floured surface, flour your hands, and knead until the dough is smooth and elastic, about 8 minutes. Alternatively, you can use the dough hook to reach the same state. Place the dough in a lightly greased mixing bowl, cover with a clean tea towel or plastic wrap and let rise in a warm, draft-free place until puffy and marshmallowy in appearance and texture. If you gently poke a finger into the dough, an indentation should remain when your finger is removed from it. Turn the dough onto a lean counter, cut in half (don't rip it, pretty please!) with a bench knife or other sharp knife, and pat each half into a rough rectangle or oval that is about 1/2-inch thick. Divide the roasted garlic between the two dough shapes and spread evenly over the dough. Roll each piece of dough into a log starting with a short side. To form each piece into a boule or ball, gently tug and pull one coiled end toward the center. Tuck it in place, rotate the dough about 45° and repeat. Continue rotating, pulling and tucking toward the center until you've gone all the way around and your dough is roughly in a ball shape. Flip it over so the smooth side is up and nestle your hands around the dough with your hands at a 45° angle to the counter. Roll the dough between your cupped hands, alternating pulling with one hand and pushing with the other, tightening the dough ball as you go. When the surface is taut, carefully lift the dough ball and place it smooth side up on one side of a parchment lined baking sheet. Repeat with the remaining dough log, placing the finished ball so that there are at least 6 to 8 inches between the two. Cover them lightly with a tea towel and let rise in a warm, draft-free place for 30 minutes. While the dough balls are rising, preheat the oven to 425°F with an empty cast-iron or other heavy, oven-safe frying pan on the floor of the oven. Bring a pot of water to a boil on the stove top. Immediately before baking, use a sharp knife or blade to score an 'X' or scallop shape about 1/4-inch into the surface of the bread dough. This allows the bread to expand without tearing as it cooks. Working quickly, slide the parchment lined pan with the boules into the oven and carefully pour about 1 cup of the boiling water into the empty pan. Be cautious because this will generate a great deal of steam VERY quickly! Close the oven door immediately and set the timer for 20 minutes. After 20 minutes, remove the water pan from the oven, close the door and reset the timer for an additional 10 minutes. The bread should be deep brown, very firm and measure at least 195°F at the center of the loaf with an instant read thermometer. Transfer the finished loaves to a cooling rack. If desired, brush generously with extra virgin olive oil and sprinkle the surface with super-fine sea salt. Let cool completely before slicing. Store leftovers at room temperature wrapped in a tea towel. Oh wow! That looks like the most crunchy on the outside, soft on the inside loaf of bread!! I want it! Thank you, Tieghan! It’s such an easy bread dough to work with! This is brilliant. I can almost taste it!! How would I serve this bread? I’d put garlic butter on it. Slice it. And serve it straight to my open mouth! Pure heaven! That bread is GORGEOUS. It is making me so excited to use that starter! 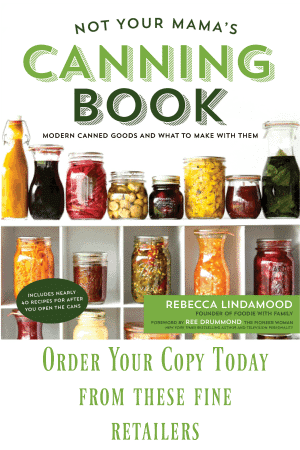 I had no idea it was descended from a sourdough strain that old, so fascinating! I wish I could smell this through my computer, baked bread and roasted garlic are two of my favorite kitchen smells. Well done!! I loooove the KAF sourdough starter!! It’s incredible and I too love that it has a long, rich history. I am completely obsessed with making sourdough and I’ve never added roasted garlic. I can practically taste it! I will be adding roasted garlic to my next loaf. Lovely! 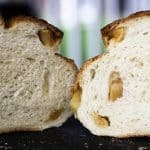 I love this recipe, I have been making it for a couple of years (love, love King Arthur flour), I use it in sandwiches, for crouton(yum) and I love it toasted with one of my home made jams. I don’t think those would survive long enough to be made into anything. Butter + that into my mouth. Done. Maybe, MAYBE split in half the long way and brushed with a garlic bread spread and lightly toasted with spaghetti. I might be able to save one loaf for that. I’ve made a lot of bread but I’ve never ventured into sour dough territory. Yeast doesn’t scare me, but that does a little. I might have to get brave! 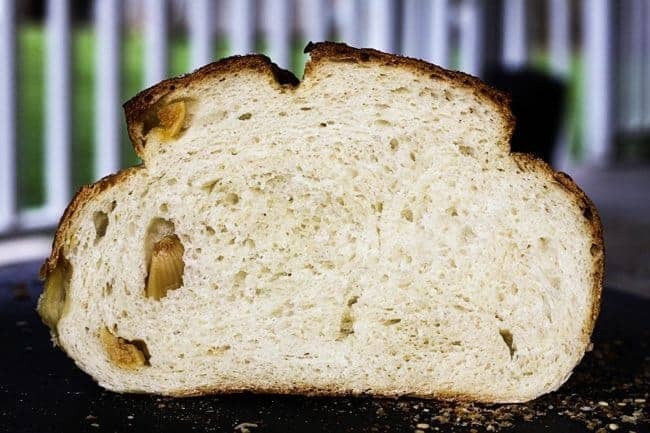 Sourdough starter + yeast = bread that tastes great AND actually rises – the best combination! These loaves are so beautiful! Oh yum! I love garlic 🙂 this loaf looks perfect! Great write up and the addition of roast garlic is genius. Thank you for the inspiration. I would probably serve this thickly sliced with lashings of butter and a crisp green salad with a sweet balsamic vinaigrette – possibly with more of that roast garlic shaken into it. That and a glass of Malbec. Great write up and the addition of roast garlic is genius. Thank you for the inspiration. I would probably serve this thickly sliced with lashings of butter and a crisp green salad with a sweet balsamic vinaigrette – possibly with more of that roast garlic shaken into it. That and a glass of Malbec.